There are times when I wonder what the draw on an episode such as this one is. It’s very enjoyable. It’s a day in the life of characters. There’s a goal for the characters which is what keeps them going from day to day, but that all fades into the background in this kind of episode. I think Akari says it best when she talks about spending a wonderful time together. It’s watching the interactions of characters, being with them as they experience different things, and spending that time with them. There’s no rush to stop an enemy, no fight against a monster, no heated battles or sappy romances. There are no cases to be solved, and there’s no drama or trauma to face. It’s at times like this when I’m put to thinking about what slice-of-life is and what it isn’t. The feel to me is that Aria the Animation moves back and forth between the two. Delivering a letter is too much of a quest for me to classify as slice-of-life. Training hard at being an Undine is too much of working toward a goal, toward the end of a storyline (although the end of one story can mark the start of a new story for the girls). Seeing the founder of Aria Company makes Akari’s position as heir to Aria make sense. 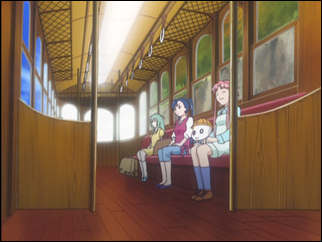 It wasn’t missed by me that Alicia and Akari share a carefree nature, with Akari the less experienced one, filled with more childlike wonder. 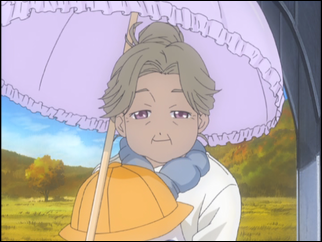 Grandma, likewise, is a carefree person who finds fun in everything she does. Just as Akari enjoys picking chestnuts, had fun digging potatoes, and excitedly tossed chestnuts onto an open fire. Akari reflects the essence of Aria Company. A person who sees wonder in everything, a person able to make anything be fun, is Aria company. Looking at technology, a train (trolley?) is used for traveling long distances. I’ve left to wonder if any manner of ship are used, to wonder what powers the train (is it electric? ), and what powers the various flying vehicles (transportation ships, and delivery bikes). A touch of world-building for Manhome slipped in nicely, with talk of how you can’t plant things in the soil on Manhome. It sounds more and more like Aqua is intended to be the future of man, once Manhome has become uninhabitable. My guess would be that the efforts to terraform Aqua took place alongside efforts to clean up Manhome, and the latter is going to be a much longer process due to all the damage that has been done. A beach episode. Yukata. Coming up, hot springs. 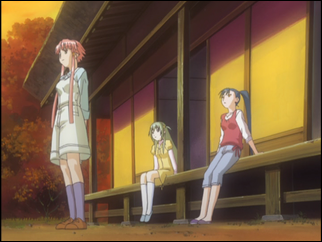 These are common things in Japanese series, yet Akari, Aika, and Alice are experiencing them for the first time. Akari had never been in the ocean at a beach. Alice had always slept on a bed. Depending on where the viewer lives, they may be watching experiences personally unknown, such as an American who’s always slept on a bed, or a person living surrounded by hundreds of miles of land all around. In a series such as Aria the Animation, the viewer need only sit back, relax, and enjoy. Oh, and I really like Akari’s overalls in this episode. Thumbs up to the person who decided to go with that style, and it’s very fitting of her character and personality. Akari’s last words, in each preview, are “Let’s spend a wonderful moment together” — and that does sum it up. Aria is a series of wonderful moments. 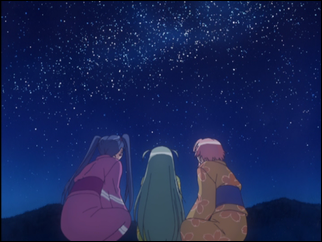 The viewers are led to treat watching the show in the same way Akari treats everything in her life, with a carefree and grateful appreciation of what is immediately set before them. And Aika’s repeated embarrassments in this episode seem designed to show that forcing the present joy into a larger goal doesn’t earn one anything, and indeed misses the point.